• Decrease the meat and add more vegetables in your dishes. • Use whole wheat flour instead of refined flour when you bake. • Blot your fried foods to take off the extra oil. • Use low fat yogurt instead of mayonnaise. • Try skim milk instead of normal one. • Use non stick cookware to reduce the need of oil to cook. Microwave or steam your vegetables instead of boiling to avoid loss of nutrients. Fats in your foods should be maintained minimum. Choose lean meats and skim dairy products. Fats are good in the form of nuts, seeds, fish, olives, when they are accompanied with other nutrients. Some amount of fats while cooking is good as help the body to absorb fat soluble vitamins. If the recipe calls for more fat then modify it your way. Try these tips. If you need to use oil, try cooking sprays or apply oil with a pastry brush. 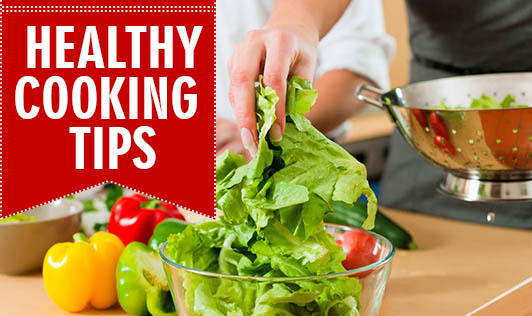 Cook in liquids (such as stock, wine, lemon juice, fruit juice, vinegar or water) instead of oil. Use low fat yoghurt, low fat soymilk, evaporated skim milk or cornstarch as thickener instead of cream. Preserve the water soluble vitamins which are easily destroyed by your cooking methods. Choose to scrub the vegetables than peel as there are many nutrients in the skin. When you have to boil the vegetables retain the vitamin rich water and use it as a stock in another preparation. Make your sandwiches healthy. Switch to reduced salt wholemeal or wholegrain bread - for example, some brands of soy linseed bread. Don't butter the bread. You won't miss butter if your sandwich has a few tasty ingredients already. Limit your use of spreads high in saturated fat like butter and cream cheese; replace with scrapings of peanut butter or other nut spreads or low fat cheese spreads or avocado. Choose reduced fat ingredients when you can, such as low fat cheese or mayonnaise.